A new SB Nation podcast focuses on sports across the three service academies, and promises interviews with current and former athletes and coaches. The show will be hosted by U.S. Naval Academy graduates Lieutenant (LT) Justin Mears and Lieutenant (LT) Austin Lanteigne, U.S. Air Force Academy graduate Scott Lopez, and Army National Guard veteran Specialist (SPC) Kaylah Jackson. Mears also serves as the manager for SB Nation’s Against All Enemies. The show will cover news from all of the nearly 30 different sports offered by the service academies, specifically focusing on football and men’s and women’s basketball. The hosts will interview current and former service academy athletes, coaches, and fans as they share the storied legacies of Army, Navy, and Air Force sports. The show’s name is a reference to the oath all academy student-athletes take to defend the U.S. Constitution. 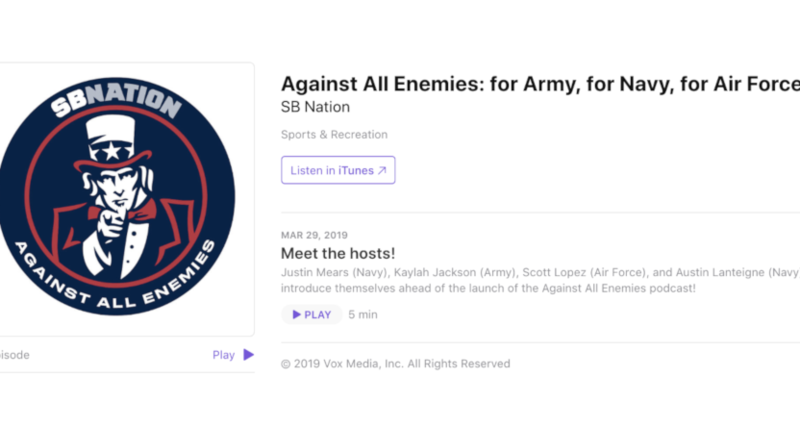 The first episode of Against All Enemies, available today, includes an interview with Billy Hurley III, the only veteran on the PGA Tour, as well as a preview of the Army vs. Navy lacrosse game taking place on Saturday, April 13. New episodes will be published each week. Team-focused podcasts obviously have an audience of their own, as shown from recent investment on that front from sites like The Athletic. So one key target here is those who already care about sports at the service academies. But the release goals of Against All Enemies could perhaps be interesting to a broader audience than those concerned with the Xs and Os of, say, Army football. That might especially be true if Against All Enemies winds up doing a lot of those interviews. Student-athletes and coaches at the service academies both face some unique challenges, something explored in shows like Showtime‘s A Season With Navy Football, and there might be plenty of people who aren’t diehard fans of the service academies, but are interested in the perspective of someone like Hurley (who graduated from Navy in 2004), or other current and former service academy athletes and coaches. We’ll see how this turns out, but it’s certainly not your average sports podcast concept.